January 18, 2019, TUCSON, AZ – A verdict of guilty was issued by Federal Magistrate Judge Bernardo Velasco today, convicting No More Deaths volunteers on all charges. Natalie Hoffman, Oona Holcomb, Madeline Huse, and Zaachila Orozco were charged with entering a national wildlife refuge without a permit and abandonment of property, and Ms. Hoffman was also charged with including operating a motor vehicle in a wilderness area, all misdemeanor offenses. A date for sentencing will be set within the next ten days. Sentencing for each charge can range from 0 to 6 months of time in federal prison and a fine of up to $500. 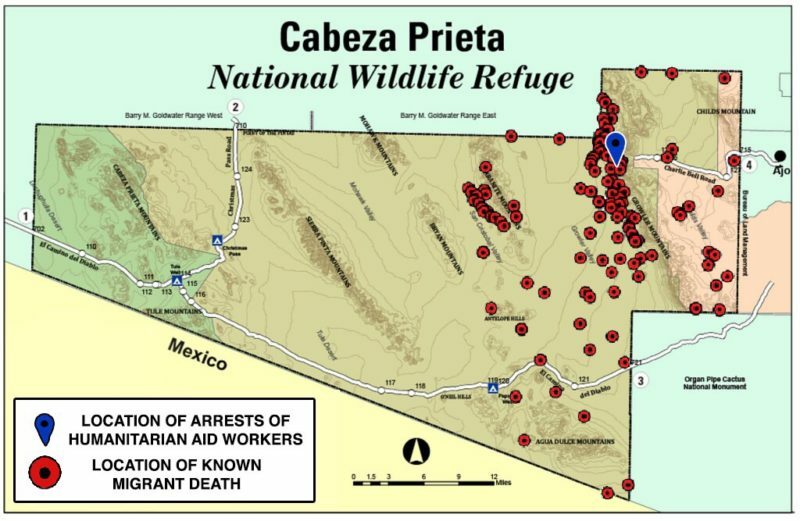 The four aid workers are among nine No More Deaths volunteers facing prosecution for their efforts to place life-saving food and water on the Cabeza Prieta National Wildlife Refuge, a vast and remote area south of Ajo, Arizona where 155 border crossers are known to have died since 2001 and countless more have gone missing. The remaining volunteers facing misdemeanor charges are scheduled to begin trial on February 26 and March 4 of this year. 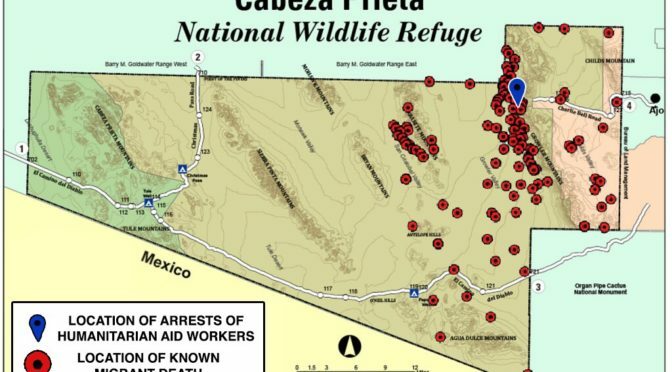 The remaining five volunteers facing misdemeanor charges for work on Cabeza Prieta are scheduled to begin trial on February 26 and March 4 of this year. One of the defendants is Ajo resident Dr. Scott Warren, who is also charged with felony harboring and conspiracy related to humanitarian aid work. Dr. Warren’s felony trial is scheduled to begin in late May of this year.